Isolated showers. Partly cloudy, with a low around 68. Breezy, with an east northeast wind 11 to 15 mph, with gusts as high as 21 mph. Chance of precipitation is 20%. Isolated showers before noon. Mostly sunny, with a high near 83. Breezy, with an east northeast wind 16 to 18 mph, with gusts as high as 25 mph. Chance of precipitation is 20%. Isolated showers. Partly cloudy, with a low around 68. Breezy, with an east northeast wind around 15 mph, with gusts as high as 21 mph. Chance of precipitation is 20%. Isolated showers before noon. Mostly sunny, with a high near 82. Breezy, with an east northeast wind 16 to 20 mph, with gusts as high as 28 mph. Chance of precipitation is 20%. Isolated showers. Partly cloudy, with a low around 69. Breezy, with an east northeast wind 14 to 16 mph, with gusts as high as 22 mph. Chance of precipitation is 20%. Isolated showers before noon. Mostly sunny, with a high near 83. Breezy, with an east wind around 16 mph, with gusts as high as 22 mph. Chance of precipitation is 20%. Isolated showers. Partly cloudy, with a low around 70. 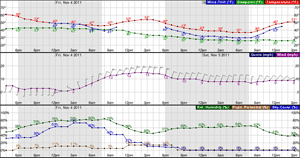 Breezy, with an east southeast wind around 16 mph, with gusts as high as 22 mph. Chance of precipitation is 20%. Isolated showers before noon. Mostly sunny, with a high near 83. Breezy, with an east northeast wind around 16 mph, with gusts as high as 22 mph. Chance of precipitation is 20%. Isolated showers. Partly cloudy, with a low around 70. East wind around 14 mph, with gusts as high as 18 mph. Chance of precipitation is 20%. Scattered showers, mainly before noon. Mostly sunny, with a high near 84. Breezy, with an east northeast wind around 15 mph, with gusts as high as 21 mph. Chance of precipitation is 30%. Scattered showers. Partly cloudy, with a low around 71. Breezy, with an east wind around 16 mph, with gusts as high as 22 mph. Chance of precipitation is 30%. Isolated showers. Mostly sunny, with a high near 82. Breezy, with an east northeast wind around 16 mph, with gusts as high as 22 mph. Chance of precipitation is 20%. Scattered showers. Mostly sunny, with a high near 82. Breezy, with an east northeast wind around 16 mph, with gusts as high as 22 mph. Chance of precipitation is 30%.